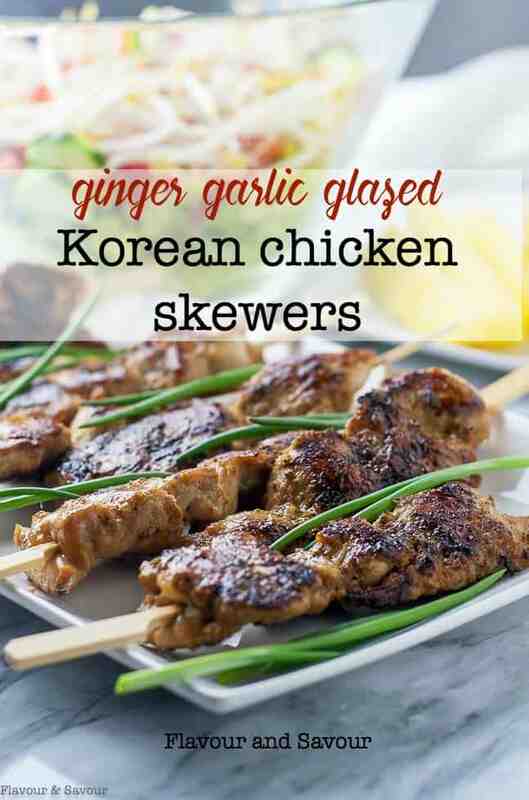 Sweet and spicy, salty and succulent Korean-style chicken skewers in a ginger-garlic glaze. Paleo. We’ll be snacking on these Glazed Korean Chicken Skewers this weekend while watching the closing ceremonies of the Olympics. Have you been following along? 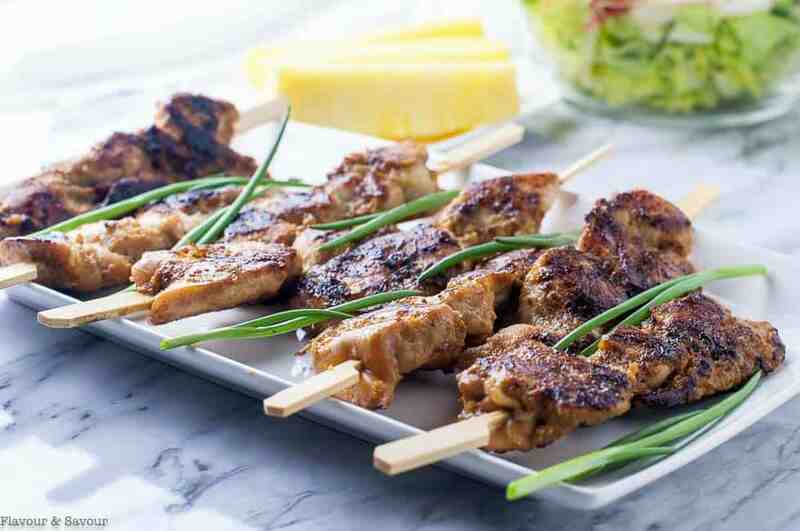 If you love Chicken Satay, you’ll probably love this chicken-on-a-stick with an Asian flair. It cooks quickly on an indoor or outdoor grill. It’s sweet, salty, spicy and succulent. 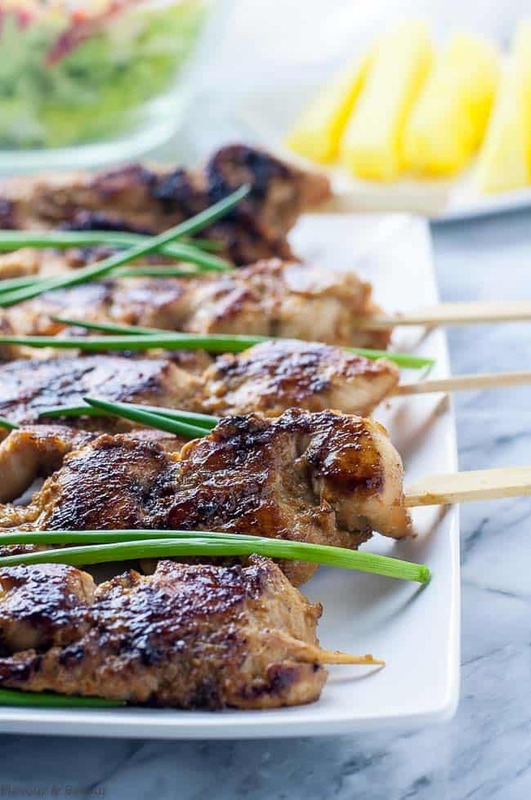 Do I need special ingredients to make these Korean Chicken Skewers? No. The marinade is flavoured with onion, ginger, garlic, soy sauce and sweetener. 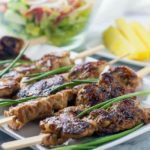 While I have included substitutions to make this recipe suitable for those on a paleo diet, if that doesn’t apply to you, you can use tamari soy sauce instead of coconut aminos and brown sugar instead of coconut palm sugar. Adding Asian pear to Korean dishes helps to tenderize meat and adds some natural sweetness. In this recipe which uses chicken tenders or sliced breasts, tenderizing is not necessary, but pear adds a subtle sweet flavour. If you don’t have an Asian pear, you can use crushed pineapple, or just leave it out. No green onions? Fresh chives or a scattering of parsley could be substituted. I made this a quick recipe by using a mini food processor to purée the marinade ingredients instead of chopping by hand. grill and brush with glaze. What should I serve with these Korean Chicken Skewers? Sweet and spicy, salty and succulent, these Ginger-Garlic Glazed Korean Chicken Skewers need no special ingredients. They're fun to eat, grilled food-on-a-stick! 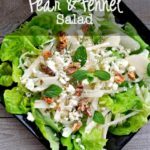 This recipe is suitable for paleo diets. Soak 16 - 20 wooden skewers in water for at least an hour to prevent burning on the grill. Combine onion, garlic, ginger, coconut aminos (or soy sauce), sesame oil, coconut palm sugar (or brown sugar), pear, salt and pepper in a food processor, pulsing until thoroughly mixed. Pour over chicken in a marinating dish or zipper-closure bag and marinate for at least an hour, preferably longer. Thread the chicken strips or cubes on the soaked skewers. Pour the remaining marinade into a small saucepan, bring to a boil, then reduce the heat and simmer for 5 to 10 minutes or until sauce has thickened slightly. Grill chicken skewers for 4 to 5 minutes each side, turning and basting with the reserved sauce. Garnish with thinly sliced green onions. 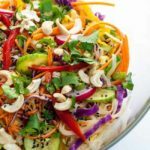 Serve with rice, rice noodles or cauliflower rice. 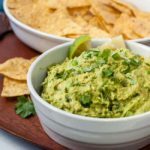 I adapted this recipe from Closet Cooking, making a few substitutions to make this recipe suitable for a paleo diet and simplifying the preparation. 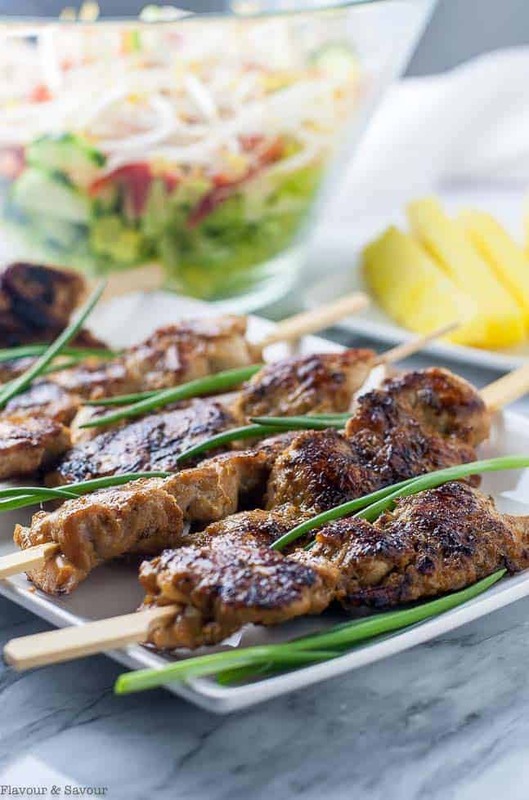 These skewers look delicious! i love that you’ve included paleo instructions, too! I must try these. Thanks Cathy! It’s a great all-round marinade that you can use on other meats, too. I absolutely love the flavors here and really want to try this with salmon! I love how flexible this is. Recipes that allow for a pescetarian spin are always a win in my books. I think it would be really good with a white fish, too, as it has lots of flavour that would complement a mild-flavoured fish. Thanks for commenting! Love the flavour combo Elaine! 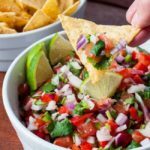 This recipe definitely has me looking forward to grilling season!